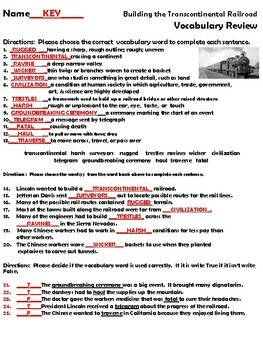 This is a vocabulary review sheet that correlates with McGraw Hills Open Court Unit 5, Week 6 story "Building the Transcontinental Railroad". I have created a review sheet that will require students to match the vocabulary term with the definition, and created sentences based on the selection which will test students' comprehension as well as their context clue skills. Students will also be asked to read a statement that includes a vocabulary word. They must decide if it is used correctly. If it is they will respond with True, if it is not used correctly they will respond with False. This is a great way for students to practice their vocabulary words! It can be used as an assignment, in a center, or as homework. I have several other products that relate to the vocabulary terms for this story. I have created a vocabulary organizer, vocabulary cards to keep the words displayed in your classroom, and vocabulary skit cards. All of these activities are part of my lesson plan bundle for "Building the Transcontinental Railroad". You'll get everything you'll need to successfully teach this story! Be on the lookout for more products related to the Open Court series! Thank you for considering my products. Don't forget to leave feedback if you purchase, so you can earn your TPT credits!